Lucky Peach: AWWWWWW YISS. 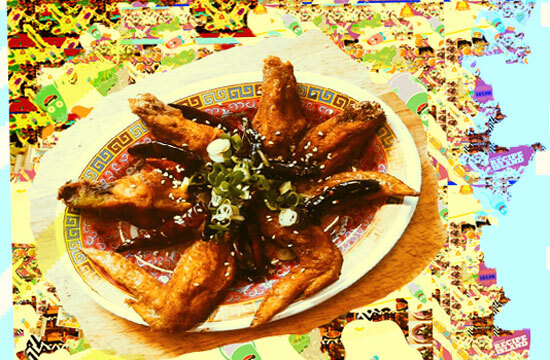 It’s the recipe for Danny Bowien’s cortex-warping spicy Chongqing chicken wings, which, spoiler alert, will undo your attachment to material things and put you on the third path to enlightenment. The New York Times: Mark Bittman gets the same crappy PR emails we do, except we clearly didn’t get invited to an event where a NASCAR driver flies a hot-air balloon sponsored by Wonder Bread. Is Mark Bittman that much more pro-Wonder Bread than us? Really? Eater NY: In lawsuit-land, Scott Conant is filing suit against his former business partners, accusing them of a long and winding list of transgressions. No, seriously: it’s complicated. Reddit: The world is obsessed with Adam Richman’s weight loss. No really, look at Reddit. The Daily Meal: Duff Goldman, who has never tried a cronut, asked a reporter at The Daily Meal if they taste like churros. The reporter said that they’re more like “a buttery, fluffy donut,” which we would like to formally call them out on. It’s nothing like that texturally, at all. It’s exactly like a churro. We’re pretty sure this reporter has never tried a cronut in her life. MasterChef Casting: We know you’re amped for next week’s MasterChef Junior premiere, but if you think you can BLOW THOSE AMATEURS OUT OF THE WATER, then you should know that the adult MasterChef Season 5 is currently casting in a city near you.